A Catholic Relief Services Charitable Gift Annuity (CGA) is a way for you to make a charitable gift that helps CRS serve poor and vulnerable people overseas, and guarantees a fixed lifetime income for you and/or someone you designate part of which is tax free. You donate cash, stocks, bonds or mutual funds to CRS and ask us to establish a gift annuity. You may choose your preferred payment schedule. Calcluations provide and annual (annuity) amount, but you may choose to have that annual amount distributed monthly/quarterly/semi-annually/annually. 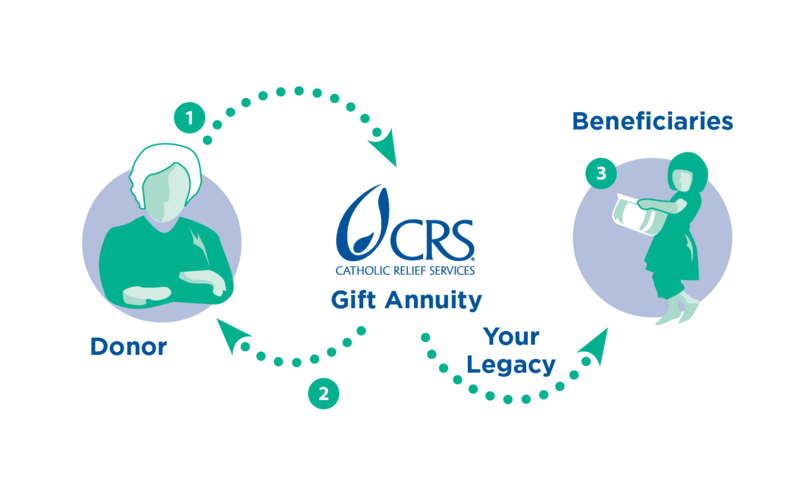 Once we finalize the gift annuity agreement, CRS will begin paying a fixed, guaranteed amount of lifetime income to you and/or anyone you name based on your selected schedule. After your lifetime and/or that of your selected beneficiary, CRS will use the remaining principal from your gift to continue our lifesaving work overseas. Donor pays no management fees for the life of the annuity. Annuity payments are guaranteed by CRS for life. Do Charitable Gift Annuities Have a Place in Retirement Planning? Absolutely! A gift annuity can add income, diversification and reliability to a retirement plan. Guaranteed lifetime income reduces risk. The combination of high-yield, tax-free income, a charitable income tax deduction and, in some cases, a reduction in capital gains taxes can markedly improve the performance of a retirement plan. Remember, a gift annuity is not a traditional investment instrument. A distinct difference is the irrevocable nature of a gift annuity. Once established, you cannot change or reinvest a charitable gift annuity in another way.